in Bagram, Afghanistan, March 2, 2009. 1st Platoon Personnel Security Detail. In announcing a new Afghanistan-Pakistan strategy, Pres. Obama said that an additional 4,000 trainers and advisors will be sent to the region to assist the Afghan army. In his remarks, the President stated that “The safety of people around the world is at stake”. The video is here; will try and see if I can embed it here later. Excerpt below from the Prepared Remarks of President Barack Obama on A New Strategy for Afghanistan and Pakistan Washington, DC March 27, 2009. Read the full text here. To advance security, opportunity, and justice – not just in Kabul, but from the bottom up in the provinces – we need agricultural specialists and educators; engineers and lawyers. That is how we can help the Afghan government serve its people, and develop an economy that isn’t dominated by illicit drugs. That is why I am ordering a substantial increase in our civilians on the ground. And that is why we must seek civilian support from our partners and allies, from the United Nations and international aid organizations – an effort that Secretary Clinton will carry forward next week in the Hague. At a time of economic crisis, it is tempting to believe that we can short-change this civilian effort. But make no mistake: our efforts will fail in Afghanistan and Pakistan if we don’t invest in their future. That is why my budget includes indispensable investments in our State Department and foreign assistance programs. These investments relieve the burden on our troops. They contribute directly to security. They make the American people safer. And they save us an enormous amount of money in the long run – because it is far cheaper to train a policeman to secure their village or to help a farmer seed a crop, than it is to send our troops to fight tour after tour of duty with no transition to Afghan responsibility. As we provide these resources, the days of unaccountable spending, no-bid contracts, and wasteful reconstruction must end. So my budget will increase funding for a strong Inspector General at both the State Department and USAID, and include robust funding for the Special Inspector General for Afghan Reconstruction. And I want to be clear: we cannot turn a blind eye to the corruption that causes Afghans to lose faith in their own leaders. Instead, we will seek a new compact with the Afghan government that cracks down on corrupt behavior, and sets clear benchmarks for international assistance so that it is used to provide for the needs of the Afghan people. In a country with extreme poverty that has been at war for decades, there will also be no peace without reconciliation among former enemies. I have no illusions that this will be easy. In Iraq, we had success in reaching out to former adversaries to isolate and target al Qaeda. We must pursue a similar process in Afghanistan, while understanding that it is a very different country. Wanted: Expressions of Interest – Herat, MeS and ??? Lots of staffing news lately – the State Department is hiring, USAID and MCC are hiring and if you work for the Feds already but do not like your job – State may have a job for you in its new Civilian Response Corps. Reports here and here put the number of new hires for the State Department alone at approximately 2,300 in 2009. That’s 1,200-1,500 new career Foreign Service and Civil Service employees above attrition. In a related, but expected development – Secretary of State Clinton reportedly sent a cable to Foreign Service officers last weekend announcing plans to create more diplomatic positions in Afghanistan. I doubt if anyone in the FS community was taken by surprise, especially after the President’s decision to send more troops to Afghanistan. “As part of our expanding efforts in Afghanistan, the department intends to create 14 additional FS positions in Herat and in Mazar-e-Sharif in 2009,” Secretary Clinton wrote. According to AFPS the State Department is “soliciting expressions of interest now” for the seven positions in both Herat and Mazar-e-Sharif. 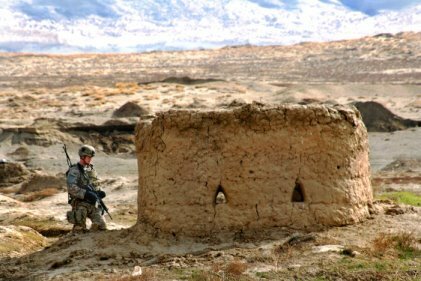 The initiative reflects an ongoing expansion of the State Department’s efforts in Afghanistan that began last fall. 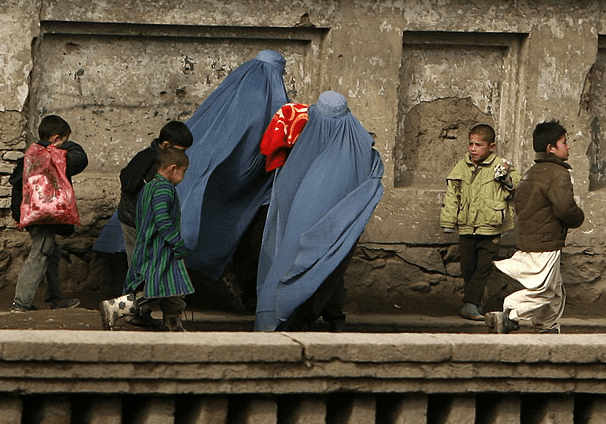 Reports indicate that the State Department has allocated 28 new positions to Afghanistan with supplemental funds authorized in fiscal 2008. As of May 2008, the United States was leading 12 of 26 PRTs and 13 other coalition countries were leading the remaining 14 PRTs in Afghanistan. The GAO reports that as of April last year, 10 of the 12 U.S.-led PRTs included 88 or more military personnel—the majority of whom provide security and other support for the PRTs—and 3 civilian personnel from State, USAID, and USDA. 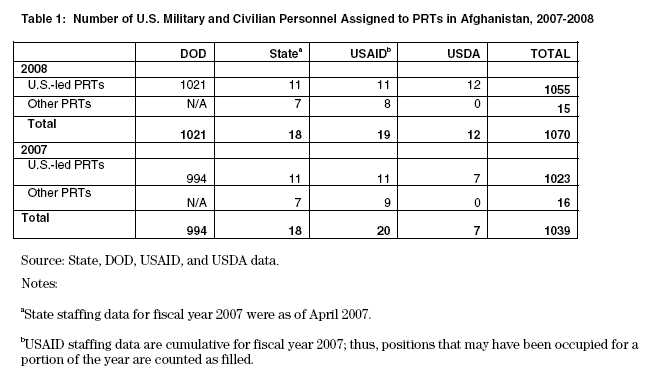 The total number of U.S. government personnel assigned to U.S. PRTs in Afghanistan increased slightly from 1,023 personnel in 2007 to 1,055 personnel in 2008—which includes 1,021 military personnel from DOD and 34 civilian personnel from State, USAID, and USDA. DOD is responsible for paying nearly all of the costs associated with operating PRTs, such as providing their security and life support. 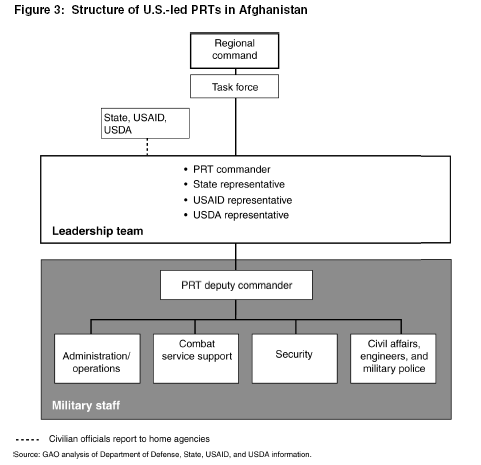 All PRTs in Afghanistan are under ISAF’s operational command, but individual nations, including the United States, lead PRTs and determine their size and structure. 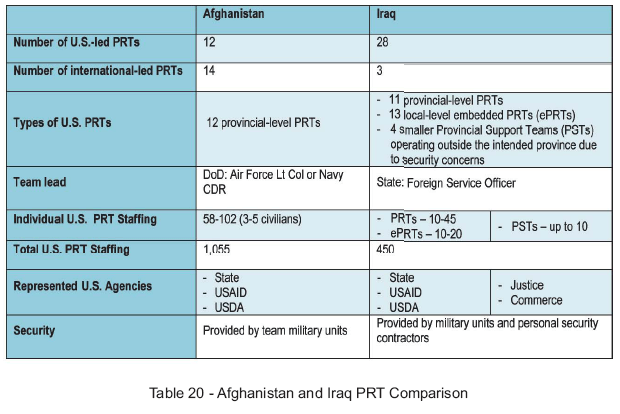 U.S.-led PRTs in Afghanistan are led by DOD and are composed primarily of U.S. military personnel. How is this going to change with additional civilian personnel? Probably won’t change very much since the civilian surge appears to be heading to the Regional Commands in the North and in the West where we have just one US-led PRT (Farah). Quick background — ISAF was formed under a United Nations (UN) mandate in December 2001 to assist the government of Afghanistan in creating a secure environment to enable reconstruction. From 2003 to 2006, ISAF created PRTs, while Operation Enduring Freedom established 17 additional PRTs and transferred them to ISAF. 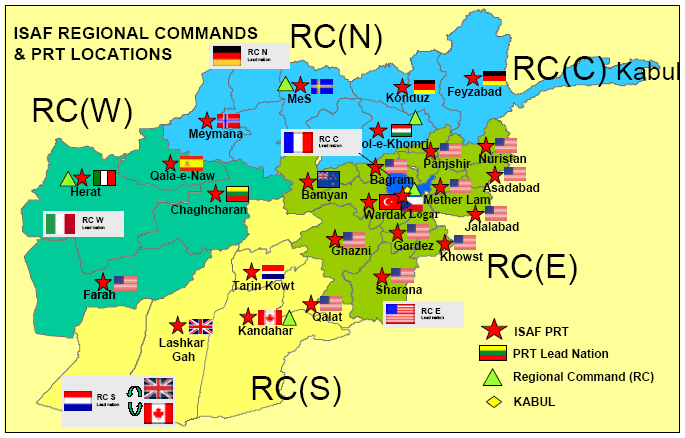 All PRTs came under ISAF’s command on October 5, 2006, when ISAF assumed authority over eastern Afghanistan from the U.S.-led coalition and the United States assumed command of ISAF’s Regional Command East. The GAO report also indicates that in January 2008, the U.S. Ambassador to Afghanistan (William B. Wood) requested an additional 16 State and USAID staff to support PRTs in Afghanistan. In the request, the Ambassador proposed that some of these staff be placed at regional commands and brigades to provide functional expertise as needed. So over a year later, it looks like he’s getting about as many as he wanted but not necessarily where he wanted them. But — there will soon be a new ambassador in Kabul. The new guy may decide later that he needs more — not just in the PRTs but also in the regional commands. State’s solicitation of interest is for assignments in Herat and Mazar e-Sharif. Herat falls under the Regional Command West, with four ISAF PRTs currently led by Italy. Mazar e-Sharif is in the Regional Command North with five ISAF PRTs led by Sweden. With this new civilian “surge,” the total PRTs should be about comparable in size with the PRTs in Regional Command East where most of the US-led teams are concentrated in . I suspect that this call up is just part I of the civilian surge; we may yet see additional PRT staffing needs in Regional Command South, where there are currently only 4 ISAF PRTs in operation. We might even see an even further expansion of RC-West and RC-North, after this initial call up depending on how things work out there. But like they say, this is the bright hot spot right now — if you can’t get into the AfPak team in Foggy Bottom, I’m betting that this is the next best thing… Check out this Flag Grade Reading List for Afghanistan Service if you’re thinking about a tour in Afghanistan.